The e-book is not included in the premium membership benefits as it is provided by our affiliated company. On March 13, 2018, South Korea released No. 15488 Cosmetics Act and it entered into force on March 14, 2019. 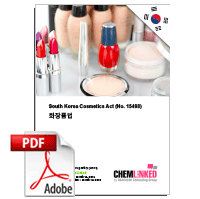 This Act is the overarching regulations for cosmetics in South Korea, providing measures for the manufacture, import and sale of cosmetics and cosmetic ingredients, including detailed requirements for the labeling and advertising of products. Compared with the previous version, the new act makes some amendments on cosmetics business operation, procedural rules, natural and organic cosmetics certification system, etc. Obligations, etc. of Manufacturer, Sellers, etc. Reporting on Business Closure, etc. Prohibition of Distribution or Sale of Animal-Tested Cosmetics, etc. Reissuance of Certificate of Registration, etc.